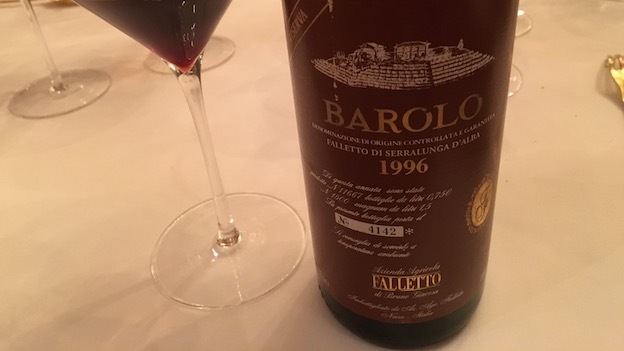 Bruno Giacosa’s 1996 Barolo Riserva Falletto more than lives up to its lofty reputation. The wine needs time in the decanter for some initial VA funk to blow off, but when it does, what emerges is a Barolo of utterly captivating beauty. Bruno Giacosa’s finest wines are defined by haunting inner sweetness and extraordinary perfume. The 1996 has all that, and so much more, starting with a full vibrant red color and tons of intensity. Time has mellowed the tannins to some degree, but my sense is that the 1996 will always remain somewhat brutish in feel. Even so, there is no denying its beauty. Readers lucky enough to own the 1996 should be ecstatic. It is one of the world’s truly great, great wines. 98/Drinking window: 2017-2037.